Pen and two shades of brown ink on paper. 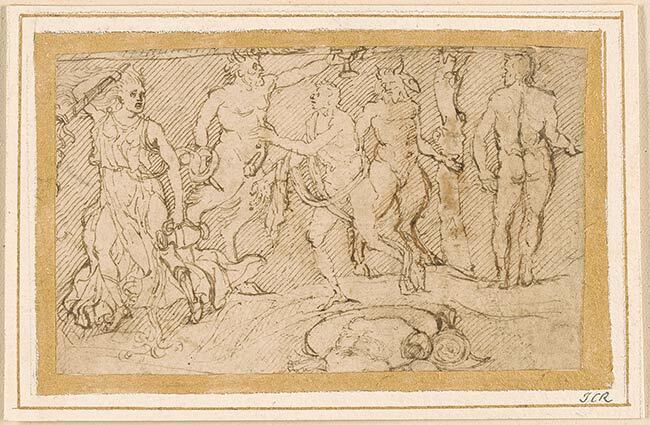 Inscribed on verso in graphite, "126 / di Gregorio Schiavone". Sir John Charles Robinson (1824-1913), Edinburgh and London (Lugt 1433); Charles Fairfax Murray (1849-1919), London and Florence; from whom purchased through Galerie Alexandre Imbert, Rome, in 1909 by Pierpont Morgan (1837-1913), New York (no mark; see Lugt 1509); his son, J. P. Morgan, Jr. (1867-1943), New York. Morgan Library & Museum, New York, inv. I, 43a: nos. 130-40; I, 43b: nos. 122-29. J. Paul Getty Museum, Los Angeles, inv. 90.GA.131; Turner, Hendrix and Plazzotta 1997, 41, no. 17 (as Genga); Rinaldi 2014, 42, no. A23. Nationalmuseum, Stockholm, inv. NMH 1384/1863; Washington and elsewhere 1985, no. 7 (as Genga); Rinaldi 2014, 42, no. A24. Kunsthalle, Hamburg, inv. 52154; Rinaldi 2014, 49, no. B14. Selected references: Rinaldi 2014, 27-28, 48, no. B13-a (as Girolamo Genga). One of 8 drawings on one mount, by same hand; some may have been cut from a single sheet.